Gothic cathedrals are an excellent example of hiding in plain sight. 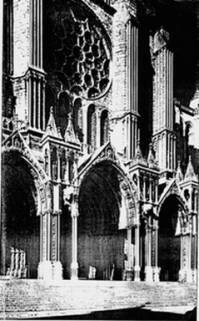 The cathedrals, with their “spiritual architecture”, where gravity is seemingly overcome by the flying buttresses externally, and where walls through architecture seem dissolve into light to allow the visible manifestation of the power of god to penetrate the building as it penetrates the soul... These buildings seem to defy gravity, great masses of stone soaring upward, yet seemingly as light as air, giving us a psychological lift from earth-like mind to heaven-like mind. The word “religion” stems from Latin religare , which means to tie up (ligare) once again, for the second time (re) . On one hand, the mystery of existence and the harmony of the universe arouse in man to a natural and genuine feeling of awe, which man expresses through spontaneous prayers. On the other hand, some behaviours – rituals and ritual prayers – were codified by a group of men – the sacerdotal class. The priest is a professional figure, a ‘pontiff', an intermediary between earth and heaven. The word stems from Latin pontifex , which means pontem facere , to build a bridge. The temporal power vested this class with the job of organizing such behaviours and to oversee the relevant performance by the laity. I will call “religiosity” the former and “religion” the latter. We know that, during ancient times, it often happened that religion conflicted with religiosity. The religious hierarchy trying to overlay the faith, religiosity, for some purposes, which cannot be considered as spiritual. This practice is called religio instrumentum regni , religion as a means of ruling; spirituality then necessarily withdrew itself, far from danger, being content to speak to those few men who had “ears to hear” and “eyes to see”. A proverb says that if one wishes to hide a tree, he has to put it in the wood, not in the desert, or, as Edgar Allan Poe noted in The Purloined Letter, the best place to hide something is in plain view. No wonder, therefore, that religiosity's voice can be still heard in catholic churches, especially in the Gothic ones, despite 2,000 years of religio instrumentum regni . The concept is one that is so vast, it cannot be adequately covered in a single article. Therefore, I will limit myself to some clues on those aspects which I believe to be fit for our purposes as breadcrumbs on the path, and leave the reader to follow them. First, let me note that nothing happens by chance in the building the of a church. An examination of these cathedrals demonstrates that within their execution, are revealed clues that they had a second purpose other than the obvious. That purpose was a project to spread a secret wisdom, embracing cosmological notions that were far removed from the Catholic orthodoxy. “Notre Dame”, in French language, means Our Lady, Madonna, the virgin par excellence . 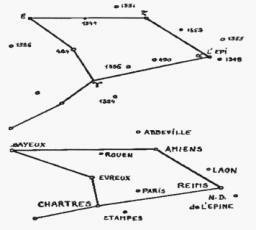 Now, if man takes a geographical map of France and finds out all the towns that host a “Notre Dame” cathedral and then joins the points with a line, he will get a sketch representing the Virgo's constellation (fig. 1). The reference to astronomy and even to astrology is common in old churches: masons paid great attention to the celestial order, which they wished to reproduce on earth. “Order”, in old Greek kòsmos , was synonym of harmony and beauty. To set up order is therefore equal to setting up beauty. The cathedral was quite more than a church; it was a true imago mundi , an image of the universe, and a means of passage from one world to another. Each Cathedral was built under its own angstrom, which is commonly referred to as “cubit”. But they are all different. Why? Therein lies a clue in the mathematics which explains the cathedral. Chartres's cubit is 0.738 metres. It is the hundred thousandth part of the degree of the parallel of latitude at Chartres, which corresponds to 48° 26' 53” and the length of which is 73.8 kilometres. The nave is 74 metres long – nearly one thousandth part of this degree – the chorus 37 metres – nearly the two thousandth part . The height of the vault and the depth of the Celtic well, under the floor, have the same angstrom. Reims is placed at 49 degrees 14 minutes North latitude, which gives a degree of parallel of about 71 kilometres. The “measure” of “cubit” should therefore be 0.71 metres. The length of Reims cathedral is 142 metres and the interior length of the transepts is close to the geometrical mean between 71 and 35.5 metres. Amiens is placed at latitude 49 degrees 52 minutes North latitude, which would give a “cubit” of about 0.70 metres. The height of the vault is sixty times 0.70 metres and the length of the transepts is 70 metres. There are many other “coincidences”. For example, the measure having served for to find out the plan, 0.82 and the cubit, 0.738, are together in an astonishing relationship. Take a right-angled triangle in which one of the angles is of 48 degrees. The long side of the right angle is 0.82 m, the short side 0.738 m. And Chartres is very close to 48 degrees. We have at once the ratio of this parallel to its height over the equator. As above, so below, said Hermetists or, in Christian terms, as in heaven so on earth. In the Basilica of San Miniato al Monte, in Tuscany, there is a beautiful zodiac. Artisans carved it in the floor (fig. 2). On the Spring Equinox a beam of light enlightens the sign of Taurus . In ancient times, this date marked the beginning of the new year; some Masonic calendars continue to adopt it. Why then Taurus ? It may appear as a mistake, since the astrological sign matching this date is Aries . To solve this seeming riddle we have to consider that, in the human body, Taurus is associated to throat. There is a clear hint to the voice, the word, the lògos which is referred to in the Prologue of the gospel of John. Lògos is the logical speech, the one which puts order; opposite to mythos which was adopted to express emotions and feelings. We can therefore infer the architecture contains an urge, that is, to start the new year by putting order within ourselves. Today, to the modern eye, this may seem unusual and fanciful, but man is to be reminded that churches were considered as a preparatory place for death-rebirth. In Milan's Cathedral the sun is “black”, for outside the church the masons put a stone-wheel in correspondence with the glass, so the sun's rays could not go through it. Darkness is then prevailing, in the same way as in any pregnancy (fig. 4). The labyrinth is another symbol which man often finds in various churches. 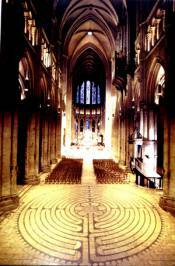 Here is the picture of the labyrinth in Chartres Cathedral (fig. 5). At its most basic level the labyrinth is a metaphor for the journey to the centre of man's deepest self and back out into the world with a broadened understanding of who he is. At higher level, however, it symbolizes the conquest of the universe's centre by the initiate, who delivers himself into the Immutable Being. Looking at the sketch of the labyrinth (fig. 6) we notice that in the centre there is a rosette which displays six petals and the corolla. The petals symbolize the four cardinal points at geographic level, that is, north, east, south and west, plus the geodetic ones: zenith and nadir. T he corolla is symbol of the centre properly said. We have so seven elements which recall us the ‘septenary' and “seven”, as we know, is a meaningful number. Among other things, it is Master Masons' symbolic age. This explains why any Master Mason can walk either along or across the lodge, at his discretion, with no fear to lose himself: now he owns the centre, “that being a point from which a Master Mason cannot err”. The labyrinth is unicursal. There is no trick, no maze but no short cut, either. One has to walk the initiatory path till the end, otherwise his efforts shall be fruitless. Once he reached the centre, man will go out by walking the same path he has walked to come in. At an esoteric level man can read this feature as an urging to spread out in the outer world, in every day's life, the wisdom he has gained in his descendent journey. “Do you bring in a lamp to put it under a bowl or a bed? 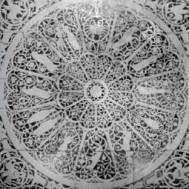 Instead, don't you put it on its stand?” (2) In Siena's cathedral a tile eloquently explains this idea (fig. 7). This tile is known as that of the ascension to the mount of fortune and wisdom. 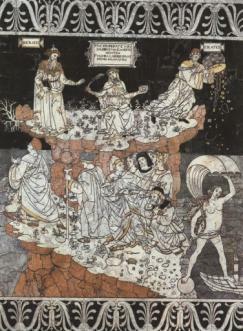 From the bottom right: Fortune is a young woman, in precarious equilibrium having one foot on a boat and the other one on a sphere. On dry land some men are sitting, some other are talking. Two of them are instead walking toward the peak. On earth, various animals sneak. This means that a man who searches for wisdom must be humble, but I read it also as an urging to go ahead without excessive hurry, rather with perseverance (as the turtle: festina lente , hurry up slowly). On the top, a woman gives the palm, symbol of heroism, wisdom and inner peace, to Socrates, who preferred to die rather than to betray his ideals; and the book of wisdom to Crates, a Cynic philosopher of the 4 th century after Christ. Cynic were the members of a sect of ancient Greek philosophers who believed virtue to be the only good and self-control to be the only means of achieving virtue. Crates gets rid of metals and other valuables. This woman is likely Isis, as the tile is opposite to another one, representing Osiris. Cynic were the members of a sect of ancient Greek philosophers who believed virtue to be the only good and self-control to be the only means of achieving virtue. Crates gets rid of metals and other valuables. Come here men, climb the harsh mountain, the beautiful results of your labour will be the palm [and] inner peace. 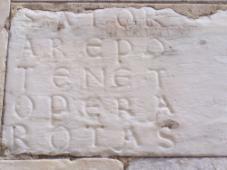 On the outer wall of the Dome, there is a strange inscription, carved in a marble plaque (fig. 8). It is a double acrostic, i. e. , it reads the same forwards and top-to-bottom as it reads backwards and bottom-to-top; and, top-to-bottom from the left side to the right, as well as bottom-to-top from the right side to the left. We find it in many places; it was written on a wall in Pompeii – to be precise on a wall in the bathroom of Paquius Proculus (fig. 9) – but actually many instances have been found, from Egypt, to Britain, to Cappadocia. The Pompeii magic square was introduced in the Empire by Roman legions, from East. Till today, priests have always been saying that it has an apotropaic role, that is, to protect the building against fire and evil. I cannot agree, apart from the circumstance that a reconcilement between faith and superstition, allowed by the Catholic church, appears odd and unlikely. Let us translate it. SATOR means “the sower”, the man who seeds. AREPO started a tough discussion. Some argued that it is an Etruscan word, meaning “plough”, but the translation would be meaningless. More simply: Romans cut the double consonant while writing on stones, so to spare work and time; the exact word is then arrepo which means “to sneak”. TENET is the third singular, present tense of teneo , “to keep”. OPERA (subject) means “work”. ROTAS (object) are the wheels. This is the right translation: I am the sower, I sneak everywhere, and my work keeps (together) the wheels (of the universe). There is then a clear hint to Hermetism or even to Panentheism, quite far from the Catholic orthodoxy. This is not just a hope, it is our aim, too. May the GAOTU help us to carry out our work. (1) Tobias Churton, The Magus of Freemasonry: The Mysterious Life of Elias Ashmole - Scientist, Alchemist, and the Founder of the Royal Society . pg. 31-32, Inner Traditions, 2006.